Discussion in 'Thumpers' started by onaXR, Jan 18, 2006. Show yourselfs. Heres mine with a flat about 150 miles from home. 2000 model 4.whatever Clarke tank, custom windshield, chain guard, disk guard, heated grips, custom rack, mini boxes, twin air filter, pirelli mt 90s. Soon small taillight, smog removal, W-B e series, daves carb mods. I just bought a used 2001 with about 4,700 mostly street miles. This is my first road bike. I'm riding it as much as possible during this messed up New England winter. This spring I will decide what mods I need to do in order to make it the perfect machine for me. So far it's already close. '04 and needing a bigger tank, a better seat, and a rack. I think I have the standard carb/airbox mods done but what are daves carb mods? Hey wheelnut, why is it so clean? I'm riding it as much as possible during this messed up New England winter. They use salt on the roads there Nut? They do here I ride 99% of the time and I spray the frame area with pam cooking spray before I ride in the wet salty mess on the roads, then spray that off like every other day. Works good for under fender area too. Daves carb mods are here..
Actually that picture is one that the seller e-mailed to me while we were discussing the details of the sale. I've since changed the rear tire to a 4.50 Kenda 270. OnaXR - Great tip - thanks. My wife will love that I stole her Pam - I already stole the meat thermometer to check the coolant temp in the truck and the turkey baster for sucking gear oil from the rear pumpkin of the truck.
. I think I have the standard carb/airbox mods done but what are daves carb mods? Basicly its the 55/158 jets, shimming the needle, drilling the slide, and modding the fuel mix screw. I still have to do this to my bike but I've heard its a great mod. I had the link up but I noticed that it had already been posted. First off, Its great to see this post. I'm Chad from Wisconsin and have an 2002 XRL that I bought in November of 04 with 2K on it. 1 Year later the bike has 9700 miles on it so I think I didn't do too bad for my first year of dual sporting. My bike was bone stock when I got it and started modding it right away. I've done these mods so far. 14/48 gearing and an x-ring chain. I'll be going back to 15/48 soon, just to try it out. Put a Moose Skid plate on, Moose barkbusters, Pro Moto Billet rack, Moose Roll Chart holder, Magellan Meridian Gold GPS on a RAM mount and Cycoactive map holder. Then did a Clarke 4.7 tank, Moose dual sport fender pack, Dirt Bike gear.com Number plate bag, Acerbis tail light, TAG CR double hi bars and some aftermarket mirrors. I've went through 3 rear Dunlop D606's and 1 D606 fron and a Pirelli MT-21 front. This was my first DS bike and due to my lack of experience and the bikes size, it went down quite a few times. Luckily, only a couple times were hard. Usually it was just I'd get it tipped to far over to recover and lay it down quick just to pick it right back up. 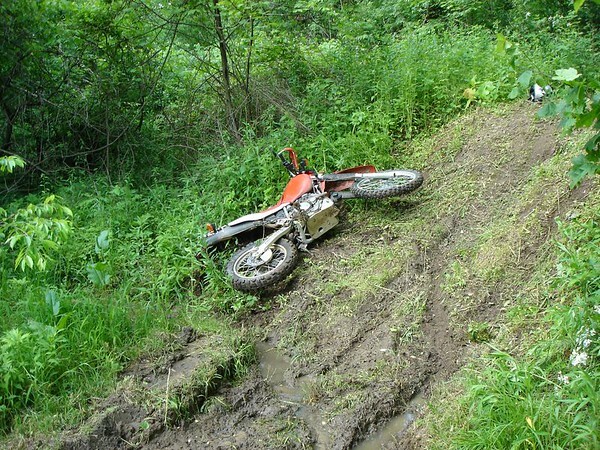 In June, my friends have a mountain bike race and wanted me to ride the course on my moto just to pack it down good, well, this is a tough trail and I put it down pretty hard and cracked the engine case cover with the shift lever. Unfortunately, I didn't notice the crack until I had ridden it 150 miles to a ds rally and ridden about 25 miles of ATV trails! The following morning we noticed oil on the dried mud and I checked the oil and it was a little over a quart low. ever since then its been burning oil so I'm taking it to a motor guy to see what needs to be done to it. Heres where I wiped out. I'm hoping to get the motor fixed, a Corbin seat, and an XR's only Slip on. Eskapada.moto and Mottsie like this. Here's my 2001 XR650L, It's been converted to a SuperMoto. 17" Excels (stock hubs just powder coated gold), RC-51 Brake Master, Stock Caliper large rotor. Michelin Macadam Tires (not Supermoto specific but good enough for now). Big Gun Race Exhaust (Junk don't buy it! ), Smog Block off, Jetted Carb (not sure what size), Skid Plate. I've already painted the number plates BLACK (can't stand white on a bike), lost the passenger pegs, and I plan on Getting a bigger Clarke Fuel Tank in the future. Possibly a better caliper too (the Duke with it's Brembo stops better), but this is still good. I got a Polisport Supermoto Fender I'm going to install and a Acerbis Cyclope headlight as well. I know a lot of people hate that taillight but it's staying for now, I like being able to be seen from behind especially at night. very sweet! I like SM's. I'm very tempted to SM mine. What paint did you use on the sidecovers? Is it holding well? Some new pix would be great! 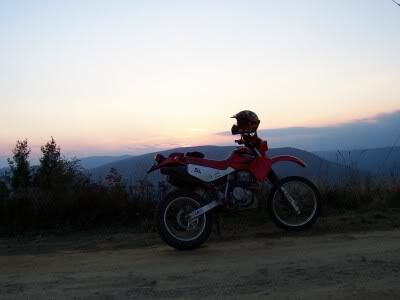 I bought my XR650L new in 2004. I did all of the standard mods: smog block off, removed air box snorkel, uni-filter, IMS tank, Dyno-jet kit, drilled carb slide, 13/47 sprockets, Big Gun pipe (ceramic coating rusted quickly)and quiet series muffler, removed rear pegs, rear fender subframe, hand guards and taillight/iicense frame, installed Acerbis taillight, homemade tag bracket, rear suspension lowering link, dipstick thermometer, folding mirrors, skid plate and Bridestone ED03/ED04's. 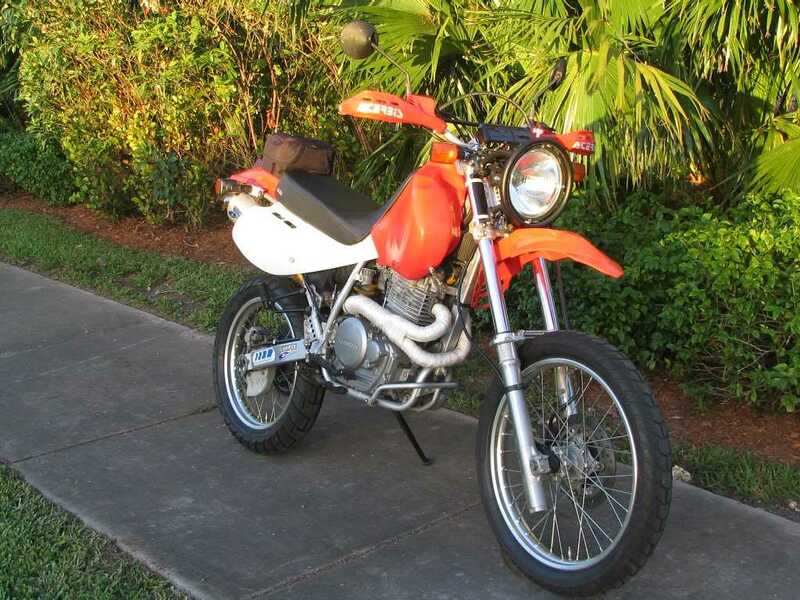 The XR650L is an ugly duckling/fat pig but I love mine. 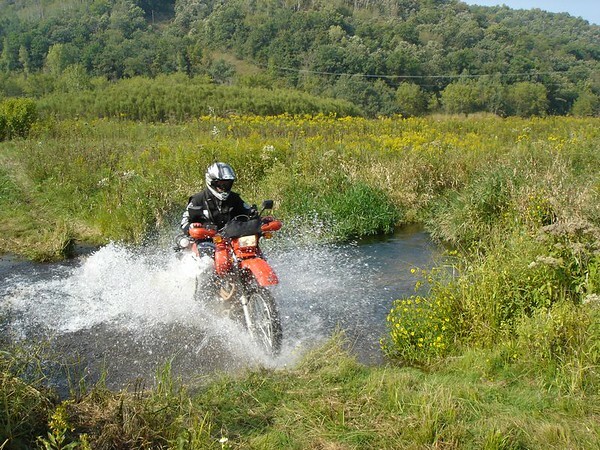 Honda, street legal and immensely capable off-road: What more could you want? OK, you gotta tell us more! Is that the trailtech HID? probably not exactly dot legal eh? do ya ride on the street much? You obviously modded the seat. any info on that? I have a 2004 650L (bought new). This is my first dual sport. I've owned three XR's and a coulpe CR's previously but this is my first road legal bike. 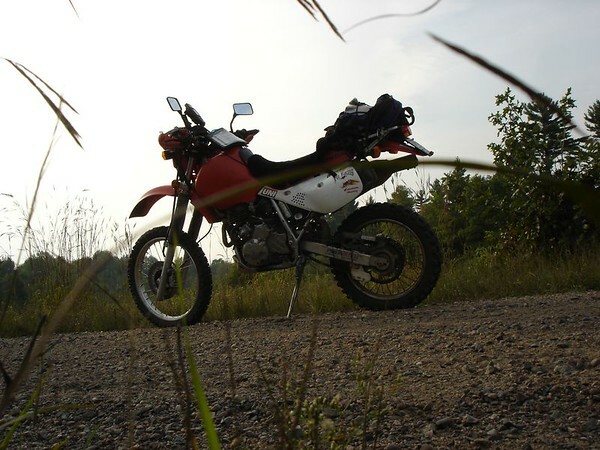 Other than racks and saddle bags, it is still stock so far. I will eventually get around to throwing some wrench time and money at it. I only have about 2,800 miles on it so far and it is beyond ready for it's forth rear tire. Being my first DS, I was shocked at the rate of wear the road has on slightly aggressive street-n-trail tire. It has a lot to do with the limited miles on the odometer thus far. As soon as I find a tire I like, I will start to bulk buying them. Other than the tire wear and sometimes being a little much to handle on the real tight trails, I am very happy with it. For some reason I actually have never taken I picture of it. Will need to put that on my list of things to do. I'm getting around 2500+ miles out of Dunlop D606's, and they are pretty agressive. I usually pay around $55 for a rear online. Wow, 2,500 would be great. I will take a look at them tonight before I turn in. Thank you very much. I ride it alot,have to change gears on longer rides,but i ride it to work alot and so far no cops give me grief about the non-dot light. Its alot brighter and less goofy lookin than the stock headlight. Eskapada.moto, Singlespeed92 and 1TRAK like this. Clarke 4.7, RSW fork brace and top triple tree, trailtech racelight with 100/130 watt 10million cp hella clear lens, corbin seat, avons, edelbrock, stage 1 cam and WB "E" pipe with big tube header. Currently building USD 320 17x350 SM front end. 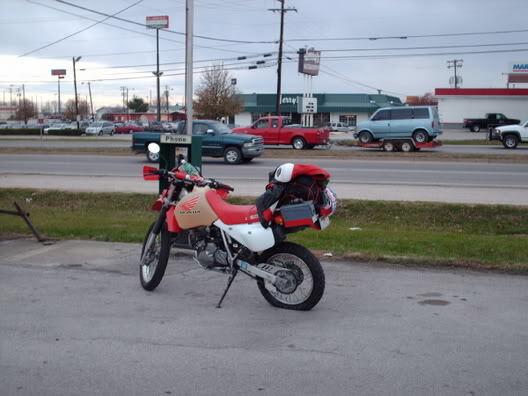 I sold my 2003 (FMF Ti-4 with Powerbomb header, K&N, re-jetted) in a fit of madness, and immediately (like, when the guy was riding off with my bike) began to miss it - after two months I went to the dealer near my dad's and plopped down for a 2006. Mods to follow. I am trying to find the part number for the exhaut system I had - I think it's the same as the XR600R. Dukeryder - what model front brake did you get - and did you get it from Motostrano? Thanks!